Weeds don’t just work their way into your garden beds and the cracks in between your paving; they can also infest your lawn. Here, we detail five of the most common lawn weeds, including how you can recognise them and how to get them under control. Cudweed is a flat, shiny weed that is coloured a mid-green shade and is shaped like a rosette. The green leafy part of this weed can bud various small flowers on its stems, and it has fibrous roots. Unfortunately, cudweed can be difficult to kill due to their glossy leaves; however, you can control them by removing them manually or spot spraying them with herbicides. Dandelions have toothy, light green leaves that are filled with a milky sap. This particular type of weed really stands out on grass as they have a solitary, double yellow, daisy like flower that sits at the top of a hollow stem. They have a thick, contractile fleshy tap-root that can be removed by hand or by spot spraying herbicide. Bindii is one of the most annoying lawn weeds, as they will hurt your feet if you stand on them without any shoes on. They have finely dissected, small fern like leaves that are light green in colour, and have compact rosette shapes. The leaf axis also grows small green flowers, while the weed develops fine, fibrous roots. The parts that hurt your feet are the small brown, flat seeds that have sharp spines on them. However, the good news is that they’re easy to control if you tend to them early enough. You can remove them by hand, but if you do, make sure you wear gloves so you don’t get pricked, but they can also be controlled with the use of Bindii herbicides if they’re sprayed in winter or early autumn, before the plant sets its seed. This type of grass weed has small, light green, clover-style leaves on short petioles. They are also spotted with small, yellow bell shaped flowers, and they form new roots whenever the stems touch the ground. This allows them to creep under and through your lawn. Their thin tap-roots are tricky to remove, as when you attempt to pull them out the crown will usually break off, leaving the roots behind to re-grow. Since they’re such a nasty and invasive weed, you can only hand remove small plants. If your lawn gets invested, you might need to dig out large sections of your grass or treat them with herbicides. Clovers, as you would expect, have clover-shaped green leaves that have silver markings on them and thin stems. When in bloom they have small, ball-shaped white flowers on their stems. Clovers are considered a weed when they’re found in grass, but they can be beneficial in other areas of your garden since they’re high in nutritional value and can help stimulate plant growth. 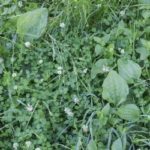 Generally speaking, clovers are usually best when removed by hand, however, there are a select few herbicides that can be used to eradicate them on your lawn. If you’re one of the many Australians who have a large residential lawn, or if you’re charged with the task of caring for sprawling commercial landscapes, you won’t just need to keep your eye out for weeds, you’ll also need to cut your grass on a regular basis. For all your lawnmower Perth needs, talk to the guys at T-Quip today!